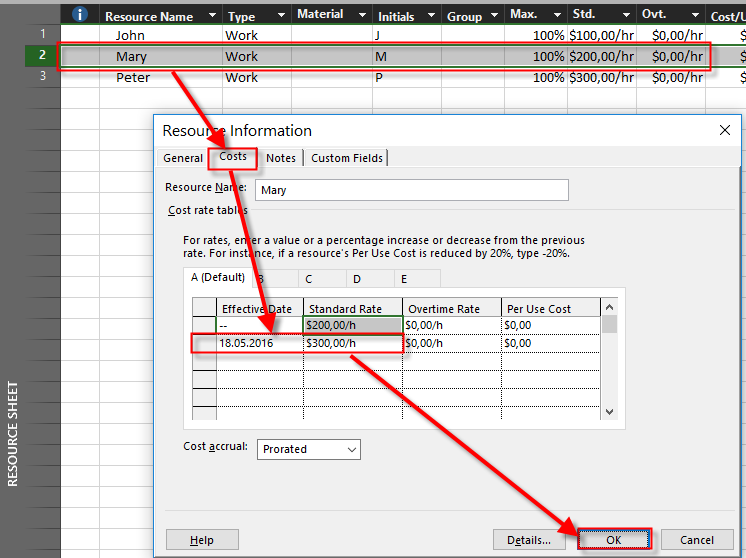 How to change rates and costs without affecting past Tasks in MS PROJECT 2016? I am wondering how you would manage a rate increase in MS Project halfway through the project that is not retroactive. 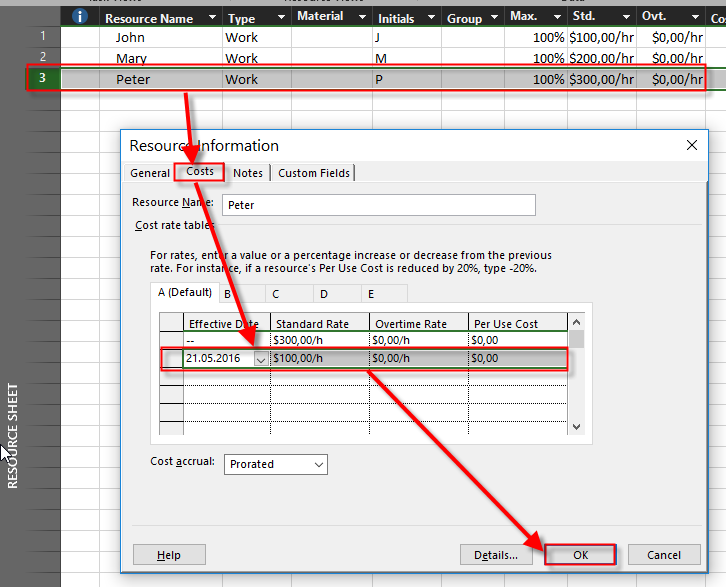 If I change the $/hr for a resource, it re-calculates the total cost for the project with the new rates. Which is not reality. I wonder if you already tackled this type of problem in one of your projects and how you went about solving it. So, that is not what my Reader wants. To avoid retroactive change of Costs when you change rates, you can do only one thing. So if you want to change cost rates with no affect to the past dates, you should follow my example. BUT! If you want to change cost rate for some date, and avoid changing cost for tasks in this period (for example, you have cost rate $100 for 21.05.2016, and you change this to $200)- forget it. This is now possible! Whenever you change cost rate for resource global, or for some period all tasks in which this resource is involved in that period will change their costs! That is how MS PROJECT works, and that is not a bug but reasonable behavior! This entry was posted in MICROSOFT PROJECT, Microsoft Project 2013, Micsrosoft Project 2016, MS PROJECT 2010, MS PROJECT 2016, PMI, PRoject Management and tagged Micorosft Project 2016, Micorosft Project 2016 - Costs, Micorosft Project 2016 - Tasks. Bookmark the permalink.